Andy Grocott, captain of 34 metre expedition yacht VvS1, reveals the wild treasures to be found north west of Auckland on New Zealand’s North Island. 1. Harataonga Bay On the eastern side of Great Barrier Island, Harataonga Bay is a bit of a mission for smaller boats to get to (across Hauraki Gulf), but a big boat can do it easily. Not many people go there and this isolation is part of the appeal. There’s a beautiful 400 metre beach — and when the weather is right, it is magic. Andy Grocott, captain of 34 metre expedition yacht VvS1, reveals the wild treasures to be found north west of Auckland on New Zealand’s North Island. On the eastern side of Great Barrier Island, Harataonga Bay is a bit of a mission for smaller boats to get to (across Hauraki Gulf), but a big boat can do it easily. Not many people go there and this isolation is part of the appeal. There’s a beautiful 400 metre beach — and when the weather is right, it is magic. Rainbow Warrior, the Greenpeace ship bombed by the French intelligence service (DGSE) in 1985, has been re-sunk in the Cavalli Islands and you can dive the wreck, which is covered in colourful sea life. She’s in about 22 metres of water and you can go with a guide. Near The Sister Rocks on the western side of Great Mercury Island is a large bay. We just anchor up, chuck on scuba tanks and 10 minutes later we’ve got a bag full of scallops; they are just there on the seabed. Likewise we catch snapper right off the back of the boat, so you can fish in comfort and style. 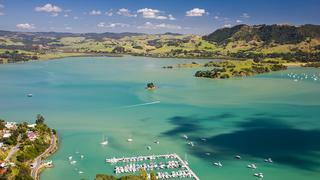 The north-western arm of Whangaroa Harbour is a good holding anchorage with serene water. You can take a kayak up into the mangroves and go up streams, or do bushwalks. Nearby is Kauri Cliffs, rated one of the world’s top 100 golf courses, so after exploring you can relax with a game. 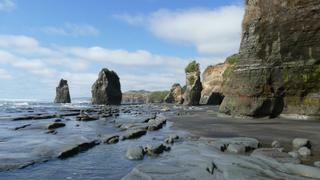 About 35 miles from the north tip of New Zealand are the Three Kings Islands, heaving with marlin. On the way are seamounts (mountains on the ocean floor), teeming with grouper; we stop on top and catch loads.